Summary: Critics and fans alike have speculated about the side-effects of ZIRP and QE (zero-interest rate policy, quantitative easing) run since 2008. One likely effect is blowing asset price bubbles. 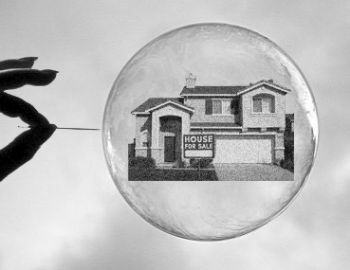 Today we have an article by Mark Hanson, an expert who believes a new RE bubble has been blown. If so, the effects of it bursting will be different than in 2008. A higher share of mortgages are government-guaranteed; a far smaller share of the non-guaranteed mortgages are subprime. But a bubble represents malinvestment of the nations resources; its bursting destroys wealth — often of people who cannot afford the loss. Warnings posted on the FM website have received fewer than average hits, despite their good track record. Let’s make this one different. Also, that we need have this discussion — five years after the last RE bubble burst — astonishes me, showing a profound failure to learn by America’s people and leaders. Note: this article looks reasonable to me, written by an expert with a great record. The subject is important; I recommend that you click through to read the full report. … This housing market is “resetting” right now; for the third time in 6 years. It might look and feel a little different, but as I detail in this note, it’s not really different this time around. We can all agree that extraordinary monetary policy and excessive speculation can cause price distortions and potential bubbles in almost any asset class. 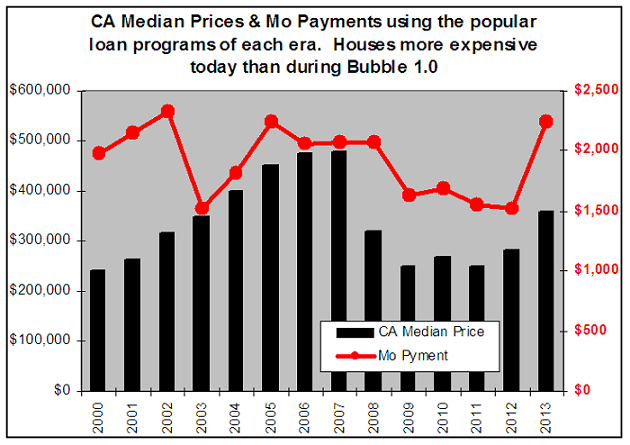 I think we can also agree that in 2006 housing was in a legitimate “bubble”. I contend that this housing market is in a bubble, right here and now. … In reality, on Main Street – to tens of millions of homeowners – from 2003 to 07 mortgages were much cheaper on a monthly payment basis than ever before in history and ever have been since. This statement is true, even when factoring in the much higher nominal house prices back then, and the recent Fed-induced sub-3.5% that lasted from 2011 through May 2013. This was because the incremental – in fact, the “primary” in many regions around the nation — buyer, refinancer, and HELOC user used “other than” 30-year fixed rate money. In contrast to the revisionist history being peddled today, the 2003-2007 era was all about introducing extreme leverage-in-finance — incrementally increasing each year — through exotic lending. This made it so people could keep buying more expensive houses and refinancing at higher loan amounts on income that didn’t support it. The advent and increasingly exotic nature of mortgage loans from 2003 to 2007 enabled the greatest “greater fool” trade of all time. Despite “rates being higher” from 2003 to 2007, everybody always earned the amount necessary to qualify for a loan; it turned virtually every homeowner in America into a Real Estate speculator driving the market with reckless abandon. Then, in 2008, when all the high-leverage loans went away at the same time, housing “reset” to what the fundamental, “organic” demand cohort could really “afford” using 30-year fixed rate, fully-amortizing financing and when made to prove their income and assets. Today, those looking at 2006 house prices as a benchmark for where house prices are headed — or assuming house prices are ‘safe’ or not back in a ‘bubble’ because they haven’t regained those prices – are looking at the wrong thing. That’s because house prices never can get back there unless employment surges and incomes rise double-digit percentage points with a respectable number in front. Or, unless all the exotic, high-leverage, no documentation loans come back. Mark Hanson is a seasoned mortgage banking veteran that specialized in wholesale and correspondent sales, operations management, and bringing financial institutions into new lending markets. His primary focus was on residential mortgages working closely with most mortgage and Wall Street investors. Since 2006, he has worked as an independent real estate, finance, and related sectors analyst, consultant, strategist, and risk ‘enlightener’ to the financial services sector with a focus on housing, mortgage, and mortgage credit. … His years of real-life experience, extensive on-the-ground research, and passion for real estate, mortgage & related sector data mining and aggregation has led to an extraordinarily large number of early and accurate predictions about the ‘great mortgage and housing meltdown’ and company-specific events. His runs a Real Estate, Mortgage & Credit Advisory covering the US, Australia & Canada. See his website and his blog. Previous Post The Economist recommends taking the easy path to inflation. But what if it’s closed? I’m no expert on housing either — but Robert Shiller is, and his warnings sound ominous. 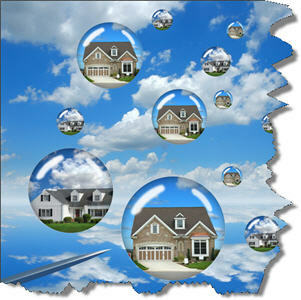 “Economist Robert Shiller: Bubble Brewing in Housing Market,” 31 December 2013. Unlike 1929, none of the bankers and financial titans responsible for today’s financial bubble (which involves a lot of criminal fraud) have gone to prison. This sends a clear message: feel free to defraud the public, there are no consequences! And the government will even bail you out if your bank or brokerage house goes broke. Unlike the 1930s, the congress today has not seen fit to put regulations in place which would prevent future bubbles and punish future epidemics of financial fraud. In short, nothing has been done since 2009 to eliminate the root causes of the fraud and consequenlty financial collapse that has devastated our economy. That suggests that it will only be a matter of time before we get another bubble, another epidemic of financial fraud, and another epochal financial meltdown. Mark Hanson believes that we’re not at the beginning of the bubble — but the end, as it might already be bursting. Perhaps, just a pause this time? Maybe a dip in activity and prices? Why do we think we are on the verge of a major downturn in housing prices? I could make sense of a long protracted weakness in housing prices and maybe even activity, but a sharp drop? why? Seems like the cost of new construction, would be supportive of existing home prices, unless we were to enter a wholesale liquidation. Is the degree of leverage so high that that should happen? If there is a bubble in housing, it would be the investors that create it, but I think this time they are going in all cash. All good questions, beyond my ability to answer. However, bubbles are a natural result of free-market systems. They do not require leverage, although leverage magnifies their effect. This is just an excerpt from Hanson’s report. Read the full report for more information. And his blog post is just a skim of his very detailed subscription-only reports. Doug PDoug asks: “Why do we think we are on the verge of a major downturn in housing prices? Here’s my answer: houses have become so unaffordable on the West Coast and the East Coast that the middle class can no longer afford to buy them. This didn’t matter during the great housing bubble of the 2000s, because people could get “liar loans” and then flip their houses, building up equity until they could finally purchase a home for a mostly-cash payment. But today, in 2014, the liar loans are gone. Banks have lost so much money on bad housing loans that they will no longer offer no-money-down adjustable rate mortgage loans on wildly overpriced $500,000 houses to minimum-wage workers with part time jobs as baristas. As a result, a dual-income family making $79,000 a year can afford only 14% of homes for sale in San Francisco in 2013. Such a couple can accord only 25% of the homes for sale in Los Angeles, only 27% of the apartments or condos for sale in New York, only 28% of the homes for sale in San Diego, and so on. As a practical matter, this means that even a top-20%-income couple making $79,000 a year is priced out of 86% of the houses for sale in San Francisco, 75% of the houses in L.A., 73% of the houses in New York, 72% of the houses for sale in San Diego, and so forth. This is clearly unsustainable. Despite all the silly talk about how “foreign buyers will continue to sustain high prices in regions like Los Angeles” or how exotic new types of loan instruments will allegedly allow these unaffordable homes to be bought, the plain fact of the matter is that, at the end of the day, if the people who live in a region cannot afford to buy the houses for sale there, eventually the prices on that housing stock will have to drop. The reason why we can expect a sudden drop in housing prices at some point in the foreseeable future is simple. Prices are still outlandish. Well over 80% of the population living in San Diego cannot afford to buy a home there. Well over 90% of the population in San Francisco cannot afford to buy a home there. And so on. This has historically not been the case. The same, by the way, is now equally true for rent. On most of the East and West coast, you would need to work more than 88 hours per week at minimum wage in order to afford a median two-bedroom apartment. Since a 2-bedroom apt is typically shared by two people, this means that two people both working 40 hours a week cannot even make enough to pay the rent if they use 100% of their take-home income to pay the rent. Once again, this is unsustainable. For an economy to function, there must be minimum-wage workers. If the minimum-wage workers can’t afford an apartment in that region, the economy is going to falter. For an economy to function, working professionals cannot live in their cars: they must be able to live in houses. If the houses are unaffordable, then the economy is going to falter. Source: “Hours at Minimum Wage Needed to Afford Rent,” The New York Times, May 2012. “Where even the Middle Class Can’t Afford To Live Any More,” The Atlantic magazine online, 10 October 2013. In San Francisco, many bedrooms are occupied by at least two people, and it’s not entirely uncommon to see situations with two parents and three kids occupying a single bedroom. Fed-induced low mortgage rates are a big part of the local housing bubble here in San Francisco, just as they are elsewhere in the country, but to get the full picture you need to take into account both the significant foreign investment (usually all cash) and also the local boom in the tech, healthcare, and finance sectors. I can’t speak for LA, New York, or San Diego, but even absent the Fed’s ZIRP, I suspect the simple fact that people will pay a big premium to live close to a hub of high-paying jobs and cosmopolitan culture would still make these places ‘unaffordable’, just perhaps less so. Why do you look at affordability of median priced apartments by minimum wage workers. Even in the 60’s when I was a minimum wage earner those apartments were out of our price range. I actually stayed in a rooming house for several years, and shared a 2 bedroom apartment w as many a 6 people back then. And it was not on the coast either. Green Bay, WI . Seems like median income would be required for median housing in any market.